house and apartment demolitions, as well as car dealerships and more. 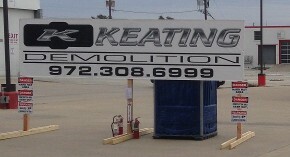 Keating Demolition is a demolition company with more than two decades of experience providing demolition services in Dallas, Texas, as well as Austin, Houston and San Antonio. We own and operate a fleet of semi and end dumps from 20-89 yards, as well as excavators from 28,000lbs to high reaches and skid and track loaders. To fast track any project with ease. call for equipment list if needed. Contact us in Dallas, Texas, to request an estimate and discover the many benefits of choosing our demolition company.